You will see there are two images of the Pudding Lane apartment block – the one below dated 4th July 2016 and the one above dated 30th March 2019. The windows back in 2015 were deemed dangerous – the reason? TWO windows had already fallen out both narrowly missing pedestrians (one fell 27th November 2015 when Riverside owned the property – it hit a vehicle!). 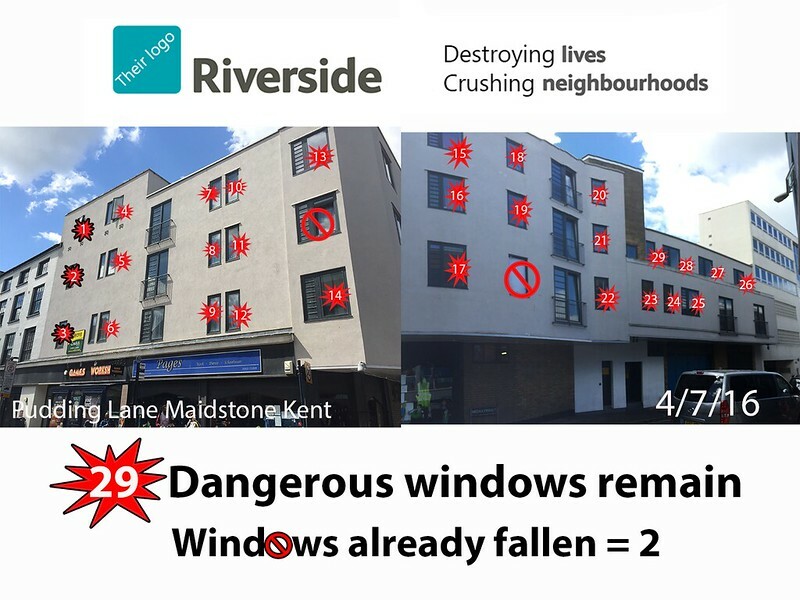 THE SAME WINDOWS REMAIN – A WHOPPING 1219 days – nearly 3.5 years Riverside group have done nothing to replace dangerous windows! What makes this worse is the fact Riverside was ALREADY AWARE of the problem as a previous window had fallen in 2013!!! So, in affect they have been aware for much longer which makes them even more culpable. STARC has been informed the windows were NEVER designed to be used at the height they have been fitted as the frames are soft wood construction. SO how does Riverside deal with this? READ ON….